Any fans of the TV show Supernatural out there? If you've been following this season, you'll know that Sam came back from hell "wrong", in Dean's words. He was pulled out of the pit and he's been hunting with his maternal grampa, Samuel Campbell (who was pulled down from heaven the same time Sam was raised) and the extended Campbell family. What Sam has been desperately trying to hide from his brother is that he came back without his soul. He has the same body, the same skills, and all the same memories, but he's so not Sam. 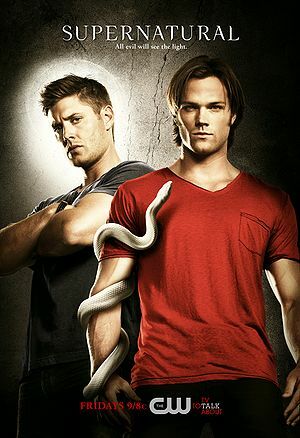 This CW promotional poster pretty much says it all, Dean with the halo of light behind him, Sam with the serpent. If you're a fan of this show, you know it's all about the bond between these Winchester brothers. It's killing me that it's not there right now, and I can't wait for them to get it back. Which, of course, will require getting Sam’s soul out of hock. In the meantime, poor Dean is very much alone even in the midst of family. Even Castiel, with whom Dean has a bond of sorts, is otherwise preoccupied in heaven, where the angels are locked in civil war. And Dean has also had to leave Lisa and her son behind when he took up the hunting life again. Speaking of which, here's a great Metallicar fridge magnet, which I keep on my desk (natch). 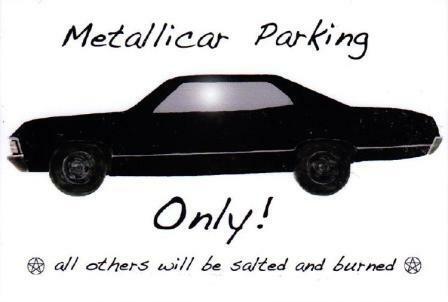 If you can't read the words, it says, "Metallicar Parking Only. All others will be salted and burned." Mwah-ha-ha-ha! I won this from the fabulous Supernatural Sisters website after correctly answering a zillion questions – matching up quotes with episode titles, I think. They're serious about their SPN over there.